It is with pleasure Galleri Brandstrup welcomes the two comprehensive exhibitions «Dødens ø" (Death Island) and" Nye malerier" (New Paintings) by Håkon Bleken. In May the artist opened the voluminous and critically acclaimed exhibition "The Road Between Abstraction and Figuration" at the Museo de Arte Contemporáneo in Coruna, Spain showing 55 works of art. In addition to several highlights from the exhibition in Coruna, thecurrent shows at Galleri Brandstrup consists of new collages and oil paintings. These works are produced in the last two years, and have never been shown in public in Norway. The series "Dødens ø" is presented in Galleri Brandstrup permanent space at Tjuvholmen all 5. The series of works consists of a number of collages and oil paintings inspired by the Swiss symbolist painter Arnold Böcklin´s series of works from the 1880s of the same name, "Die Toteninsel" which in Greman also means “Death Island”. Böcklin´s series shows a centered island surrounded by water, where a white figure, clearly symbolizing version of The Deaths portrait, onboard a boat ready to go to land. Bleken has painted this subject over and over again in the in the aftermath of the terror at Utøya in Norway, where the extremist arrived by boat. With no where to hide, 69 youths were murdered on an island. For Bleken, working with the subject have had an therapeutic effect, and all in all, Bleken produced 25 repetitions of this series, each work clearly differs from the other, taking viewer through various expressions and emotions. In some of the paintings the island is merely a cubist skeleton, some are red as blood, while others are darker and grim. 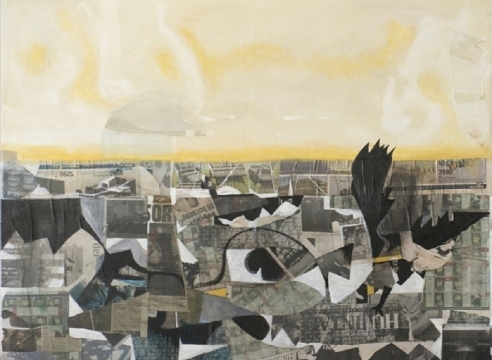 By incorporating collages of articles and newspapers into his technique,Bleken also comments on the society we live in and the myriad of narratives that surround us. One can also see the use of collages as a symbol of all the lives that ended at Utøya Island on July 22, 2011. The second part of the exhibition, "Nye malerier", is shown at Galleri Brandstrup’s temporary satellite in Tjuvholmen Allè 6. The showrevolves around Bleken´s experimental development of portrait painting. The theme’s of exhibition has a wide range, from trivial paintings of dogs as “Hund og mann” to subjects characterized by terror, as the work "Aftensang II" which shows the artists self-portrait in front of a group IS-warriors. In "New paintings" Bleken implements awide range of techniques and themes and shows his outstanding ability to create unifying symbols and a universal artistic language, whether it's self-portraits, landscapes or portraits of people surrounding him.